Naked as a design practice in contemporary luxury apartments reiterates the value of bathing culture, and at the same time, joins boutique hotels in making new spatial innovations for the bathroom. There is a close correlation in design and effect between spa facilities and residential bathrooms in the Naked mode. Wellness is engrained as a function of the contemporary bathroom, and an aesthetic approach to bathroom design is expected. Tubs or whirlpools claim to stimulate circulation, produce water massage, ease tension and reduce aches. For at least thirty years bathrooms have been marketed as a lavish indulgent space, and it is no surprise that Naked has become an important design practice in luxury apartments. In France, the luxury bathroom was popular among the nobility. Napoleon had a splendid bathroom in the Palais de l’Elysees which was so large that it resembled a ballroom.11 During the 17th century, private bathtubs were often designed for two people, for the entertainment value of bathing. These opulent tubs displayed the wealth and status of the owners by having their portraits painted on them.12 In 1765 a Paris newspaper advertised a bathroom as a temptation to buy a house. Author Ishabel Ross, in Taste in America, argues that the first complete bathroom in American history was achieved by architect Benjamin Latrobe. About 1811, he arranged a bathtub, a basin and a toilet together in the same space in a Philadelphia house, making America’s first three-piece sanitary suite.15 Latrobe’s bathroom layout was iterated over and over again. Eventually mass production of fixtures helped to bring bathrooms to Americans. In 1967, a pre-formed plastic bathroom was introduced at the Montreal World’s Fair for Habitat, in the apartment development built as part of the Exposition program. This bathroom was exported to many countries to be installed complete.17 Joe Columbo, an innovative Italian product designer, experimented with environments for the future. In 1969, Columbo created a more luxurious version of Box 1 (Night and Day Facility) in which the contents of an entire house are contained within a series of mobile elements in a space with no dividing walls. He then developed the 1971 “Total Furnishing Unit” in which all essential living spaces (kitchen, cupboard, bed, bathroom) are contained in a single unit in Colombo's signature colors of white, yellow, red and black. The “Total Furnishing Unit” was exhibited at the Italy: The New Domestic Landscape exhibition at the Museum of Modern Art, New York in 1972. Although Naked appears in boutique hotels beginning in the 1900s,18 it is a recent trend in apartments. The luxury apartment bathroom is often bigger than a bedroom in size, and it has moved to the center of the room or next to windows with stunning exterior views. A luxury apartment bathroom sometimes faces window walls that have significant views and are similar in size to a bedroom. 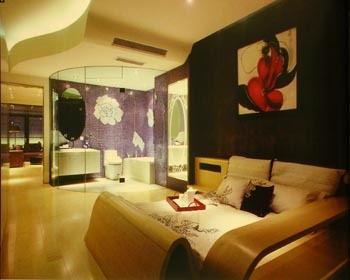 One example is the the Donghua South Road Apartment in Taipei, Taiwan. Clear glass encloses the other side of the living room and bedroom. The openness of the space allows natural light from the windows to reach the entire space. The large bathtub stands at the center of the bathroom, a pair of rectangular mirrors is suspended from the ceiling, and two boxy white Corian basins are mounted at the foot of a square soaking tub.21 The bathroom is not subordinated to the bedroom; it independently occupies one of the best places in the apartment. 1) Reyner Banham, The Architecture of the Well-Tempered Environment, 2nd ed. (Chicago: University of Chicago Press, 1984), 150. Historical research for this type is in progress by Jan Jennings. 2) Mijin Juliet Yang, “Theory studies: Contemporary Boutique Hotel Design” (M.A. thesis, Cornell University, 2005), 21. 4) Terence Conran, Bathrooms: Just Add Water (London: Conran Octopus, 2004), 6. 6) Alexander Kira, The Bathroom (New York: Viking Press, 1976), 2. 7) Brian Morris, Bathrooms (New York: Viking Press, 1971), 6-20. 12) Kira, The Bathroom, 2 - 4. 13) Kira, The Bathroom, 2 - 4. 14) Kira, The Bathroom, 2 – 4. 18) Yang, “Theory Studies, 21-24. 19) Mildred F. Schmertz, “Reaching for the Sky” Architectural Digest 61, no. 5 (May 2004): 262-267, 351. 20) “Class Dream,” Interiors (Sept. 2007): 192-194. 21) Andrew Yang, “Pearly Whites” Interior Design 79, no. 1 (Jan. 2008): S.5. 22) Evidence for the archetypical use and the chronological sequence of Naked in luxury apartments was developed from the following sources: 2000 Private Apartment (Penthouse)  Sabrina Schilcher, Interior Design; New York City in "Penthouse Forum," Interior Design 71, no. 11 (Sep. 2000): 280; PhotoCrd: Mark Ross; Private Apartment  Fernandes & Capanema, Brasilia, Brazil in Montse Borras, "Apartment in Brasilia," The New Apartment: Smart Living in Small Spaces (New York: Universe Publishing, 2007), 215; Bedroom and Bathroom, Class Dream Apartment  Yenhee Kum; Tenzin, China in "Class Dream," Interiors (Sep. 2007): 192-194; Living Room, I-Park Apartment  Peter Remedios+Design Studio, Pusan , Korea in Minsun Lee, "Haeundae I-Park," Interiors (May 2007):136-149; Bathroom, Donghua South Road Apartment  C.J. Studio; Taipei, Taiwan in Andrew Yang, "Pearly Whites," Interior Design 79, no. 1 (Jan. 2008): S.5; PhotoCrd: Marc Gerritsen. 2) Kim, Najung.“Theory Studies: Archetypical Practices of Contemporary Luxury Apartment Design.” M.A. Thesis, Cornell University, 2009, 82-91.